Recently ‘sumikko-gurashi’ is becoming more popular in Japan. This is one of the famous character Japanese company,san-x. It is introduced as below in their homepage. Don’t you think that you wanna keep your seat at the corner(sumikko) as possible? And almost people like a corner(sumikko) seat on the train…. Do you think corner(sumikko) makes you comfortable somehow? 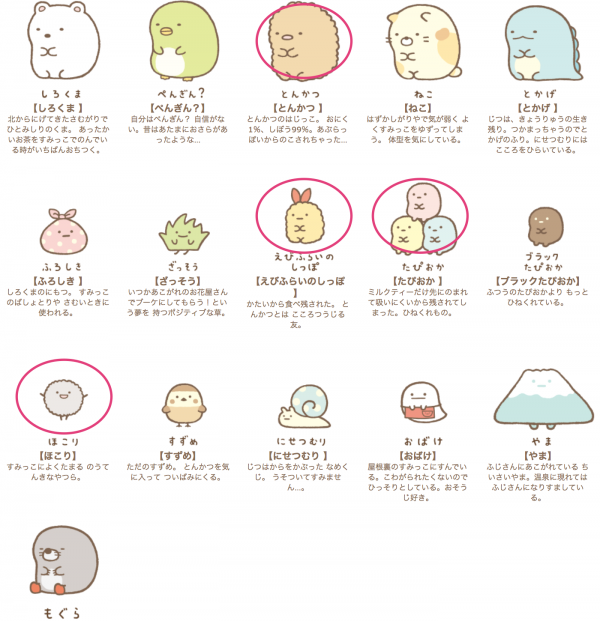 There are many negative but unique ‘sumikko’ character, such as ‘polar bear (sirokuma)’ who gets lonely easily, ‘penguin (pengin)’ who don’t have confidence, ‘pork cutlet (tonkatsu)’ who is leftover? !, or ‘cat (neko)’ who is shy. Above all, I like 4 characters circled in red among them.